Well, this volume wasn't the titan-on-titan action I thought it might have been. 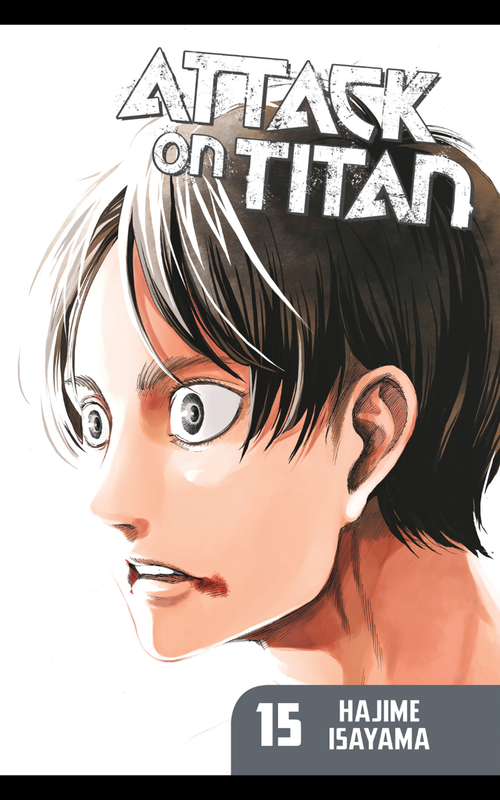 In fact, there is almost nary a titan in this entire volume outside of a jaw-dropping flashback at the end. Also, don't be fooled by the cover of this manga. Eren Yeager isn't featured at all until the very end. So the cliffhanger we experienced in the last volume isn't mentioned at all until the final pages of this volume. Of course, this volume ends on a cliffhanger, too. The bulk of this volume concerns two different but intersecting plotlines. The first of which is Levi's attempt to search for Eren and Historia Reiss. Levi and the Survey Corps have been under a witch hunt thanks to the monarchy in power and moving around has been tough. If Levi isn't careful he'll be captured, too. The second plot line is that Erwin Smith has been captured by the MPS and is on his way to the scaffold unless something miraculous happens. However, Erwin has placed his faith in the idea of a "bloodless revolution" and he won't go down without accomplishing his goal. That is the miracle he is counting on. The current monarchy must fall and the true heir must take control. That is, if Levi and the Survey Corps can even find the heir. The newspapers have been living in fear of the monarchy and publish lies to prolong the witch hunt on the Survey Corps, but a glimmer of hope appears on the horizon when Hange Zoe and the Survey Corps makes an appearance. Hange has a favor to ask of them and won't take no for an answer. Later on the newspapers begin to fight back against the monarchy along with the Survey Corps. The truth is out and the bloodless revolution seems to have been accomplished. Erwin Smith's neck has been saved. But what about Eren Yeager and Historia? Well, you'll get a taste of the truth. Boy, will you.